There’s been a big change in how scientists approach the topic of human body odor. For years it was a chemist’s game—all about analyzing sweat to isolate the stinky molecules. Dermatologists and bacteriologists were also at the table: they identified the metabolic pathways by which skin bacteria transform odorless fresh sweat into heavy duty BO. For the most part research focused on the physical production of BO. Today the game has changed—now it’s played by sensory scientists who analyze how BO is perceived, what it tells the smeller about the stinker, and how it may affect the smeller’s mental state and behavior. In this research underarm sweat is collected from people in different emotional states—fear, sexual arousal, etc.—and smelled by other people whose responses are observed and analyzed. The focus is on perception and response, the mental not the molecular. I hope to post about some of these new wave BO studies over the next few weeks. I’ll start here with an experiment by a multidisciplinary team of German researchers at Christian Albrechts University in Kiel. One of the authors is Bettina Pause who taught at CAU for many years. Since 2005 she has been a Professor of Biological Psychology and Social Psychology at the Heinrich Heine University in Düsseldorf. I’ve followed her work for years; it is rigorous, inventive, and always interesting. The researchers used a standard cotton-pads-in-the-armpits method to collect sweat from male and female donors. Anxiety sweat was collected from German university students just before and during an oral examination; a passing grade is required for graduation, hence the anxiety. Exercise sweat—the control stimulus—was collected from other students who rode an exercise bike for a similar length of time. The test subjects rated the BO smells as not particularly strong, neither pleasant nor unpleasant, and not particularly familiar. Ratings of anxiety sweat and exercise sweat were statistically indistinguishable. So we’re not talking about knock-your-socks-off levels of BO, but about faint levels of relatively unobjectionable scent. In fact, on half the presentations no odor was consciously detected at all. Despite being indistinguishable and barely discernable, the anxiety sweat and exercise sweat triggered responses in many brain areas. When the CAU imaging team subtracted the responses of exercise sweat from those of anxiety sweat, they could locate brain areas selectively activated by the odor of human anxiety. This cluster of brain areas, identified in the image at the top of this post, includes the insula, the precuneus, the fusiform gyrus and the cingulate gyrus. Wha-wha-what? OK, this is some hard-core neuroanatomy. Long story short, these are not brain areas usually active during the processing of smells. Instead, according to Pause and colleagues, these areas are active when we decode social emotions from face and body signals, when we think about the emotional state of other people, and when we make empathic judgments that distinguish between self and non-self. Here I think the CAU team gets a little ahead of its data. Even if the insula, precuneus, etc. really are mediators of social emotional processing, empathy, and so forth, there’s no direct evidence in this experiment that smelling anxiety sweat changes how people evaluate themselves, other people, or empathy-related social situations in general. Perhaps having anxiety sweat pumped up your nose unconsciously activates empathy processing centers deep in your old monkey-brain. But does it have any effect at all on how you feel about the nervous guy sitting next to you on the subway? Or how you treat the tense looking person you meet at a party? This is a provocative study, but I’m going to need more direct evidence—a change in behavior or mental processing, for example—before I hop on board the Empathy Express. I know someone that loves smell of feet and shameless, of "light" BO. I think the smell of the body has a lot to do with genes and what you eat. Sometimes it also has to do with medication. I wear deodorant only during the summer because I don't really smell. The funny thing is that I am a little bit allergic to my own sweat. When I run and my head gets wet it itches and so does my skin. I really love your articles about odors and all the projects and researches. Thanks a million Dr. Avery. Thanks very much for the information. Results are fascinating. You're quite right, I think, to maintain that distinction between 'brain' and 'mind' - or 'brain', 'mind' and 'meaning', for that matter. Thanks! I'm getting more and more interested in body odor (uh . . . intellectually, I mean, unlike your foot-sniffing friend). The chemistry and genetics have advanced more than the psychology. Now that's changing--it's a good time for BO! Eventually BO science will collide/merge with the theory and practice of fragrance selection. That should be interesting. I don't mean to be too critical of the CAU study--it's well executed. I do have a question about MRI brain studies in general. You put someone in a magnet, have him think about "X", note that brain area "Y" lights up, and conclude that Y is where X happens. This cartoon version is unsatisfying. Better if you have a well-planned comparison, e.g., have the person think about "name of X" and "visual image of X". The difference in brain activity will be much more informative. Or do as the CAU crew did and interpret the activated brain areas with reference to other studies. In that case your conclusions are only as strong as the cited studies; if they are "cartoon" studies or if there is disagreement among studies, then your conclusion is weakened. This also requires everyone to be an expert in MRI studies of every brain area in order to evaluate your study--a heavy responsibility. That's why my preference is for MRI experiments with built-in validity; in this case, say, a "how do you feel about person X" condition. Avery Gilbert, who is undoubtedly one of the key researchers on human olfaction, commented on our new study on the chemosensory perception of anxiety. I am very happy that our paper attracted his attention. I think his main point is that our interpretation of the brain’s activation might be too far away from the plain neuropsychological data. There are several reasons for us to stay with our interpretation of the chemical communication as a contagion of feelings, or an “incorporation of the feeling of others” (a term, which is actually lent from Jean Paul Sartre, who described in a fascinating way in the essay “Baudelaire” (1946) the effects of chemical communication in humans). First, we are not performing brain imaging studies in order to get to know which brain regions are involved in stimulus processing, but we want to find out what it means if certain brain regions are activated. To me as a psychologist, it is the “meaning” of the brain’s activity for human experience and behavior I am interested in. So, why did we reach the conclusions we reached? We followed three lines of evidence: Animal studies, human behavioral studies, and brain imaging studies: It is amazing to observe animals which communicate stress through chemosensory signals. The animal (flies, fish, mice or others), which just and only perceives the “body odor” of a stressed animal of the same species immediately avoids the odor source, and physiologically reacts with stress symptoms. These observations indicate that the experience of stress is transmitted through chemosensory cues from one animal to the other. Secondly, from the first studies in humans we also conclude that stress-related feelings can be chemically transmitted. Some working groups could show that the perceptual acuity for potentially harmful social signals (e.g. aggressive faces) is sharpened, while the perceptual acuity for social safety signals (e.g. happy faces) is reduced as soon as humans are surrounded by chemosensory stress/ anxiety signals (see the studies from Lilianne Mujica-Parodi, Denise Chen and ourselves). Furthermore, reflexes which are related to avoidance and withdrawal behavior, like the startle reflex, are strengthened in the context of such signals. Thus, human studies tell us also, that just the perception of these stress-related chemicals has effects which resemble changes in people, experiencing distress. Having all this in mind, we found out which brain areas are involved in the processing of chemosensory anxiety signals (We carried out a whole brain analysis, thus we did not define any a priori hypotheses). 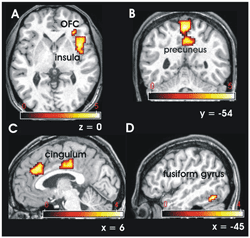 We were surprised but also happy about our findings, as we found those brain areas active, which have been described to be involved in feelings of empathy and the perception of social anxiety (fusiform guyrus). The empathy-related brain areas (insula, precuneus, cingulate gyrus) have been found to be activated in studies, investigating people who really “feel” with other people (E.g., in those studies, people are really feeling anxious, when they see others being anxious). Thus, once again, every observation seems to end up in the interpretation of this communication as an automatic transmission of feelings. In humans, we often refer to this effect as empathy. Finally, we know what we concluded is just an “interpretation”. We will probably never be able to proof any emotional states in humans, because emotional experiences are always private and cannot be measured directly. However, by now, it seems to be the most likely conclusion, we can draw. One very final technical comment: Avery Gilbert wrote that we collected anxiety and sport sweat from different people. In fact, we asked the same people being anxious while waiting for their examination at the university, some days later to ride on a bike. Thus, we can exclude the possibility that the effects were due to effects of different individuals.